This year I’m reading through a daily devotional entitled, Voices from the Past: Puritan Devotional Readings, edited by Richard Rushing. The March 16th selection on the love of Christ was from David Clarkson’s book, Works. Clarkson lived in the mid 1600s and co-labored with John Owen. Upon Owen’s death, Clarkson became the pastor of an independent church in London. I hope this reading will stir and inspire you, as it has ministered to me. One can’t live to love like Jesus unless he has experienced that love and his heart has been captured by it. "The love of Christ—O boundless love! O the unsearchable riches of Christ’s love! O happy souls that have an interest in this love, in these riches! This love made God willing to be made a curse, the Lord of life to die a base, accursed, and cruel death. Lord, there was no sorrow like Your sorrow, no love like Your love. Was it not enough, dear Savior, that You condescended to pray, sigh, and weep for us, but You were also willing to bleed and die for us? Was it not enough that You were hated, slandered, and blasphemed, but also scourged, nailed, wounded, and crucified? Was it not enough that You felt the cruelty of man, but also underwent the wrath of God? Was it not enough that You died not only once, but actually twice in soul and body enduring the second death? O the transcendent love of Christ! Heaven and earth are astonished at it. What tongue can express it? What heart can conceive it? The tongues, the thoughts of men and angels are far below it. O the height, depth, breadth, and length of the love of Christ! The love of Christ is free, unchangeable, and incomprehensible. He loved us when we had no beauty to attract His affections. We lay trodden under foot and polluted in our blood. There is nothing lovely in man. Christ knew all this clearly. In eternity past Christ saw all our faults, and not one after another, but all together. This adds great wonder to the love of Christ. He saw every perverse look, every unkind gesture, every rebellious motion, every disingenuous act. Every heart was visible from eternity. Here is the wonder of Christ’s love: it is fixed upon man, the worst of creatures. Consider His resolution, and wonder [be amazed]: 'I will give eternal life to those who have dishonored Me.'" What will we do with our friends whom God puts in our paths this week? How will we love them? Will we lay down our lives for our friends? Perhaps in some ways, we will. 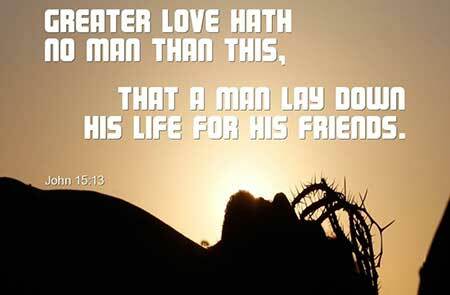 But be amazed at this: Jesus laid down His life for His enemies—which we were! What will we do with those who have dishonored, rejected, hurt, or abused us? Let His love soften your heart toward those who would naturally be your enemies, or who you might dismiss, neglect, reject, or abandon because of their failure to live and love like Jesus does. I encourage you to trust God with those who have hurt you or hurt those you love. Place them in His hands so you can be free from the power you’ve given them to make you miserable, and which hinders the flow of His love in your life. He will deal with them and execute justice. Let His mercy and grace fill you until it overflows toward others—even your “enemies”—with the same compassion, good will, and kindness that He continually gives to you. Then love like He loves. May God give us grace to love like Jesus loves, because we are amazed at His love. Consider how He has lifted us out of the trash heap of fallen mankind, washed us with His forgiveness, dressed us in the riches of His righteousness, called us to live to love with Him, and given us His presence as our constant comfort and help. The more we learn to live with this mindset, the more free we become to truly love and to experience the peace Jesus said He came to give us. This is my prayer for you this month.